At the Enterprise Connect trade show, Cisco introduced new people-centric innovations aimed at making it easier for people to collaborate anywhere, anytime in the post-PC era. From new Jabber options to an enhanced TelePresence system, Cisco is moving to optimize collaboration for the mobile world. 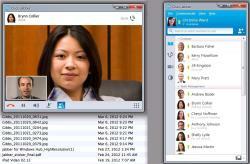 The innovations, ranging from new desktop and mobile Cisco Jabber collaboration applications to Cisco TelePresence systems, make it easy for users to move from one collaboration solution to the next based on how they work and their immediate task at hand (for example, moving from instant messaging to voice to video with the click of a button). The new Jabber and TelePresence offerings, which include a new immersive TelePresence system with optimized collaboration capabilities, are completely integrated, giving customers more mobility options while also extending the reach of their telepresence investments. Meanwhile, Cisco launched TX9000, a three-screen immersive version of its TelePresence software with advanced collaboration capabilities that integrates with WebEx and is also interoperable with other vendors. 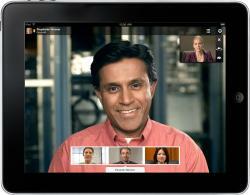 Powerful tools to extend the reach of TelePresence. Cisco is extending Cisco Jabber to iPad and Windows, building on its extensive Jabber portfolio for Android, iOS, Mac, BlackBerry and Cisco Cius tablets. With this development, Cisco is enabling Jabber customers to collaborate from anywhere and across the most popular operating systems utilizing high definition video, voice, presence, instant messaging, desktop sharing, conferencing and visual voicemail. Cisco is also expanding native integration between Jabber and TelePresence, giving mobile users a way to initiate and connect into a TelePresence session whether in the office or on the go. A new three-screen immersive TelePresence platform. The Cisco TelePresence TX9000 Series delivers the highest quality video experience along with advanced collaboration capabilities*, further building on Cisco’s wide array of TelePresence endpoints for customers of all sizes. The TX9000 integrates with collaboration tools like Cisco WebEx with One-Touch simplicity and is also designed to be interoperable with all standards-based endpoints from other vendors. These innovations also are occurring as the need for rich video solutions and mobility is burgeoning. According to Cisco’s latest Visual Networking Index, globally, 3 trillion minutes or 6 million years of video content will cross the Internet each month in 2015 and by 2016, global mobile data traffic will reach 10.8 exabytes per month (130 exabytes annually); growing 18-fold from 2011 to 2016. By 2016, mobile video will represent 71 percent of all mobile data traffic. A little more than five years ago, Cisco drove the creation of TelePresence with the introduction of the first truly intuitive and lifelike, in-person video experience. 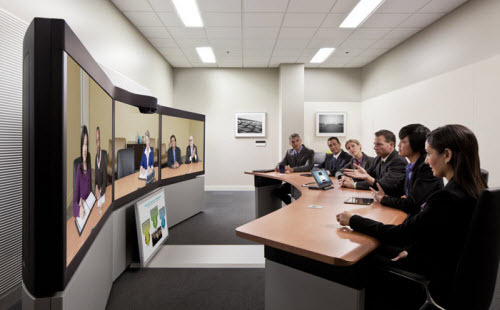 Cisco is continuing to innovate with the newly designed three-screen TX9000 immersive system that is intended to combine the highest quality TelePresence experience with advanced collaboration and content sharing capabilities. The TX9000 builds on Cisco’s broad portfolio of endpoints that extends from the boardroom to the desktop and beyond. As the pace of business becomes more complex, the meetings that drive decisions are becoming more dynamic and data-centric, requiring multiple inputs for quick turns. These types of business-critical meetings range from brainstorming sessions to product engineering and design, acquisition integration, and crisis communication planning for globally distributed teams, require high-intensity collaboration capabilities that allow people to easily share and interact with content in TelePresence meetings in ways not previously possible. These advanced collaboration capabilities include sharing content on the main TelePresence screens, point and highlight capabilities, white boarding, moving content from screen to screen, and introducing data from multiple content sources. Advanced Cisco WebEx integration enables one-button-to-push simplicity for scheduling and starting WebEx and TelePresence integrated meetings with future capabilities to support adding WebEx ad hoc to any TelePresence call using the Cisco TelePresence Touch interface. Easily start and manage meetings using the Cisco TelePresence Touch user interface with “one button to push” simplicity that provides a consistent experience across the entire Cisco collaboration product portfolio. The TX9000 is targeted to begin shipping in the second quarter of calendar year 2012 with the advanced collaboration and content sharing features targeted for availability later in the calendar year. List pricing in the United States starts at $299,000. Regional variations may apply. More Related News: Cisco: What Mobile Internet Traffic Will Look Like by 2016?